Nice and quiet relaxing stay. Really enjoyed the massage chairs. Could not ask for more! What a great find! Very good location. Quiet and comfortable room. Fantastic facilities (including a self-help laundry) and extraordinary helpful staff. But then, everybody in Melbourne is helpful. Very good. Love the green credentials which seem to be REAL! more than just not washing towels. Very comfortable beds. Loved the proximity to train station and free access to great gym. Free wifi was great. Love the "green focus" . Room small but comfortable and clean. Would highly recommend. Great apartment for us with two under 6 year olds. Tram outside the hotel, supermarket at the train station across the road. Excellent staff and we loved the massage chairs in the relaxation room. Some late night/early hours noise that woke us from outside but didn't wake the children as no window in their room. Very enjoyable, close to everything. Fantastic! We have already recommended Alto to 5 friends and we have only been back home for a couple of days! We will definatley be coming back. Thankyou for such great service. Only disappointed we didn't get to try the chef's food over christmas, we heard it was very good though. The room was very comfortable and I felt like being at home. All the people of the hotel were kind and helpful. Free espresso was delicious and great. I will definitely recommend this hotel to my friends and family, and hope to stay again. I felt extremely safe and comfortable, which is rare for me. Staff were very friendly and I had no need to request or ask for anything as everything was covered at check in. Bed very comfortable as were pillows. Loved the library idea (I owe you a book - next time I will bring several). However one should not step on scales day after Christmas ! Thanks to all especially the folk on Reception. Very good, no problems with booking or checking out and smooth service. Lovely place, slightly noisy at night with the trams but overall thumbs up!! We had a very good weekend and hope to do it again soon. Excellent - always a lovely place to visit, very comfortable and plush rooms, with great green initiatives. Keep up the good work! Comfortable, clean, great location, helpful and friendly staff. our stay at the Alto was delightful! we have absolutely no complaints about the room and the staff were exceptional. thank you for such an enjoyable stay. Our experience was most agreeable and relaxing at The Alto Hotel. The bed was the most comfortable we have had in any hotel/motel/cruise anywhere. Location is brilliant for transport, entertainment venues and proximity to the centre of the city. I cannot think of a single criticism. 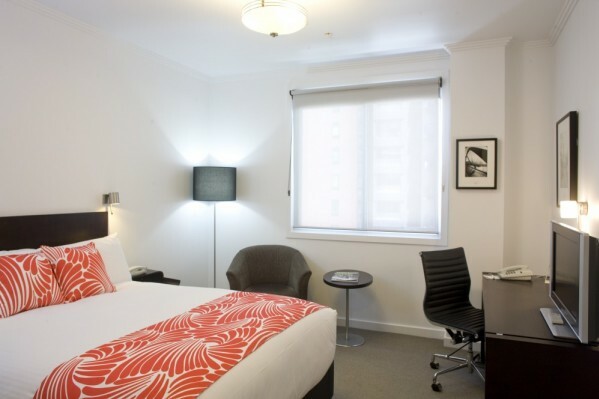 We will definitely stay at the Alto Hotel On Bourke in future visits to Melbourne. very good and enjoyable. staff was very helpful and breakfast was good everyday. please keep up the standard! Value of money. High quality service. I had a wonderful 5-day stay with my family at Alto Hotel On Bourke. The rooms were clean and very comfortable. The staff were extremely friendly and helpful. I was pleasantly surprised that the hotel actually lent me a key to the backdoor so that we could push my mum's wheelchair into the hotel without any problem. I would definitely recommend this hotel to anyone visiting Melbourne! Being a heritage listed building we are not permitted to add a ramp at our main entry. However level entry is available on request via a side door that requires key access. My only complaint which is not the hotel's responsibility was the Friday and Saturday noise in the nearby lane, Saturday night almost unbearable. I found the staff to be extremely accommodating and helpful. We were very happy with our 5 night stay at the Alto and would certainly consider staying there again if the circumstances were right. Everything was excellent - staff, service & all that the hotel has to offer. Would definitely stay at the Alto On Bourke again if in Melbourne in the future. We enjoyed our stay at Alto Hotel. It is a small yet very friendly place to stay. We stayed two weeks and felt everything was nicely organized and prepared for us daily. Thank you for a fine stay. We will be back. Great spot, easy walking distance to anything you need, friendly staff and comfortable rooms. Had a great stay, found it an ideal location, two bedroom apartment was great, everything you needed. Staff friendly and helpful. Very pleasant overall but found room size a bit small.Apart from the closet there was no bench space to put bits and pieces on. Very comfortable, good service and assistance. Trouble free. The location is great. We appreciated the energy conservation focus. We missed having a window that reveals the weather outside and were disappointed in the tiny sink and lack of counter surface in the bathroom. The restaurant was lovely. This hotel is well siturated in the heart of Melbourne the staff and the service was above and beyond all expectations.We will be back. Loved our time at your hotel, will stay again on our next visit to Melbourne. Very comfortable stay. Appreciated the well-equipped kitchenette. Wifi was stable and essential for finding information, something which many hotels don't offer or charge a fee for. Staff members are welcoming, friendly, helpful and professional. I didn't have to spend a single cent on transport because every main attraction was a pleasant walk from the hotel. Very thankful the skybus was so near. I loved the bathrooms. Very well-designed with thoughtful placements such as a bath towel hook just outside the shower stall, a multiple bar towel rack and a retractable clothes line. I'll definitely recommend this hotel to family and friends. The staff was very helpful. They answered email questions promptly before we arrived, checked us in efficiently and seemed to know who I was ie. I felt like they were expecting me as their guest. It was very nice.